Isn’t it devastatingly wonderful when a passage from a book seems to capture your life so perfectly? Thanks for that, Terry Pratchett. By now I’m sure you’re all sick of hearing about my time in England. “We get it! You were @CambridgeUK! Move on!” Have patience my dears, that is exactly what I’m trying to do here! But there is this little thing called closure and I’d very much like to try it out. You’ve already seen posts about my wonderful experiences, now I want you to see one about what I took away from them. I think we can all agree that as we live our lives and experience new places and people and things, we are influenced to change ourselves. We want to remember the little lessons we learned so we can incorporate them in our daily lives and hopefully pass them on to others. To England, here are some of the things you influenced in me, I’ll try my best to pass them on, with love. They’re everywhere! It has been a long summer of back and forth between deciding whether or not to Google the meaning behind blue doors in the UK (you’ll be happy to know that I’ve finally settled on not to) because everyone seems to have one. There must have been hundreds that my eyes stumbled across throughout my travels in England, Scotland, and Ireland. 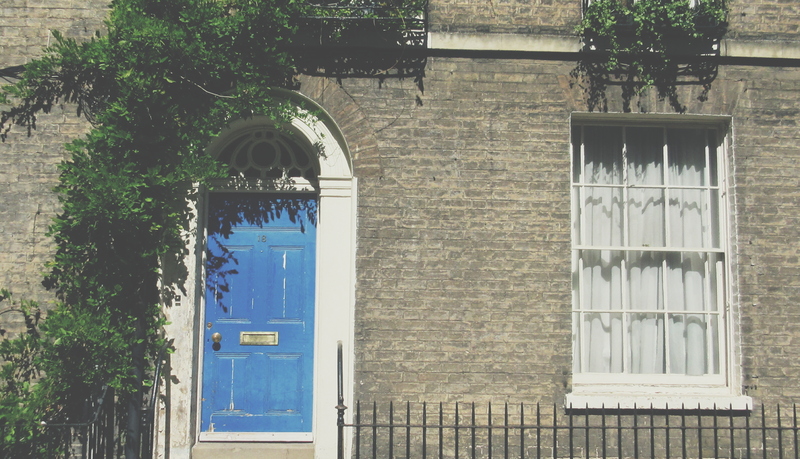 My own accommodation in Cambridge had a beautiful blue door (pictured above) as did every other house on Fitzwilliam Street. I couldn’t help but smile at the sight of them. There is such a homey, welcoming vibe to blue doors. They remind me of the pineapple symbol in Newport. I felt like if I walked up and chapped on a random blue door, I’d be ushered inside and offered tea and cakes and a fascinating life story. There is just something so truly magnificent about them, I love them, I can’t wait to have one. It’s easy to get caught up in a beautiful place when you’ve been told two dozen times that it’s beautiful. It’s a whole other matter to decide all on your own that you find your surroundings beautiful. 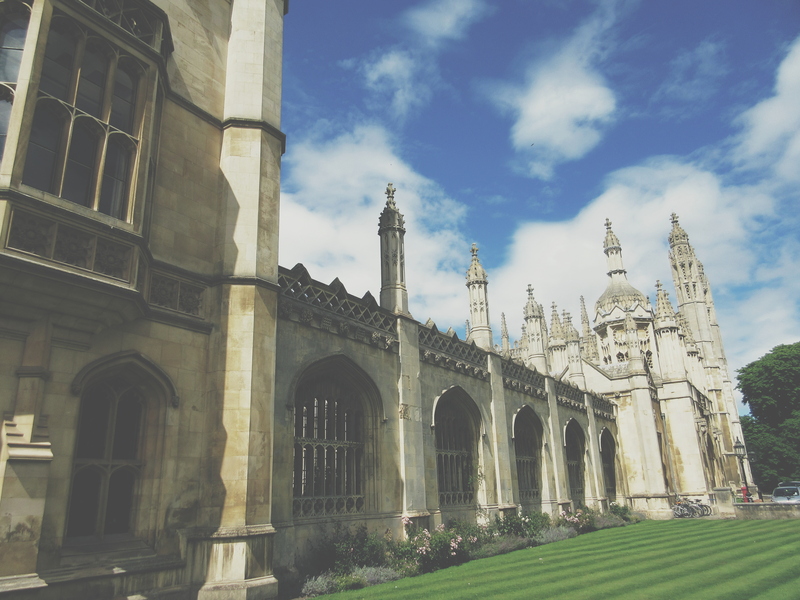 Don’t get me wrong, it’s hard not to appreciate King’s College for what it is – but there were also so many other tiny side streets along the edge of the River Cam or groupings of trees on the grounds of ancient estates in the countryside that felt infinitely more beautiful to me. A lot of other students chose to visit other cities on the weekend because they were on a quest to see something fantastic – they wanted the Sistine Chapel and the Eiffel Tower and the Remnants of the Berlin Wall. Which is totally fine! Do it while you can, I get that. But don’t disregard the seemingly insignificant places either. Surroundings mean more than just settings, too. It’s an incredible feeling to notice how genuinely gorgeous your friends’ smiles are, or the twinkle of a strangers eye when you make small talk with them. Don’t forget to appreciate where you are when you’re there. Take it in, smile and laugh to yourself, smile and laugh to others. Be there. There’s a reason this rhymes with “Me Time.” Most mornings I followed the routine of waking up early, packing up my laptop, and heading round the corner to a nearby cafe for tea and toast. It helped me to ease into my day. Some mornings would be spent writing emails to my two best friends back in the States, some spent reading a book or an article for class. Sometimes I’d just cruise the internet for a bit. No matter what, I took the time to start the day off with me, myself, and I. That’s important. Refresh yourself before you jump in to life with others. Find a time of the day you want to give to yourself, even if its just for a quick cuppa. In the same way that Me Time is important, social time with a really great group of people is just as high up there on the list. Every Tuesday, myself and four other wonderful darling beautiful women would take some time to go get a drink or two. We’d chat, we’d laugh (mostly to tears), we’d play, we’d tell stories, we’d get into all sorts of trouble. I relied on this day of the week because I knew that it would be a break from the bubble – I’d be away from classes and schoolwork and other students in favor of enjoying the little nooks of Cambridge pubs with incredible friends. The time we spent together was always on the lighter side. No one got into deep, existential conversations. We just made ourselves happy. That’s it. Tuesdays were pure happiness and I will forever cherish them. I hope to continue the spirit of Brewsday for a long, long while no matter where I end up in the world. Thought provoking discussions are all well and good but I like being talked at every now and then too. I especially like being talked at about really cool things I find genuinely interesting. I especially, ESPECIALLY like being talked at about really cool things I find genuinely interesting by really cool people who are genuinely interested in what they’re talking about! What I’m trying to say here is I loved my class lectures. I loved attending the additional plenary lectures (aka basically learning for fun since nothing required us to be there). I loved listening to my friends tell me stories about the experiences they’ve had in their lives or what they find fascinating. Being talked at creates the perfect atmosphere for introspection, which I crave more and more every day. Provoke your own thoughts instead of focusing so much on other peoples. This feels a little like a cheating point because duh! Everyone says that! Every person on the planet talks about how crucial it is to “Be You” but not everyone actually listens to those people. I like to think that at the ripe old age of 22, I’m pretty comfortable with the person I am. And more than that, I’m happy with the person I am. I wear my bright yellow Star Trek shirt around Dublin, a trip which I took all by lonesome to begin with, because I love it. Sometimes I still carry around a stick and pretend its a wand. I laugh at myself! I think that I’m hilarious because I crack me up, which is pretty important. I got comfortable with all of this over the summer and learned: Be You because You make You happy! Figure out what it is about yourself that makes you smile. I know that’s not easy to do, and that’s okay. You don’t have to do it right this second. But know that there are people out there in this world who will also smile at that thing and if you haven’t found them yet keep on moving until you do. And if you don’t ever find them, even better – you’re too cool for the rest of us anyways. Sure, I ran into the odd Brit or two who seemed to have all the wrong opinions about Americans, but I avoided them as best I could and rejoiced in the dozens of other nice people I came across in the UK. I don’t think I’ve ever really spent time thinking about what it means to be hospitable and how it goes beyond just being friendly and welcoming. There is also a part of it, which the people of the UK really excelled at, that asks you to be unboundedly helpful. While writing this I attempted to provide some examples, but that could make up a whole other post in itself (it won’t – I won’t subject you to that – but it could). What I took away from all those people is that community is not just the place where you live, it’s the way you treat the people you’re surrounded by – and that means treating your neighbor of 5 years the same as the passerby American girl here for 3 days. Hospitality is important, being kind to one another is important, and realizing that a helpful act no matter how small can absolutely change someones day is the most important of all. A beautiful stained glass window in the Museum of London. “Dieu et Mon Droit” is the motto of the United Kingdom outside of Scotland. Contrary to popular belief, I’m doing more than just drinking over here in lovely Cambridge, England. As my last post informed you, I’ve been participating in the Pembroke-King’s Programme at the University of Cambridge this summer. Yes, I’ll admit that I prefer spending my time running around with my friends on Brewsday Tuesday and playing Quidditch and having movie nights but I’m here first and foremost for academics apparently. At my home university, I’m a Finance major by day and also still a Finance major by night. However, I had a few elective courses that I had to clear in order to graduate this Winter (don’t want to talk about it yet, still not ready). 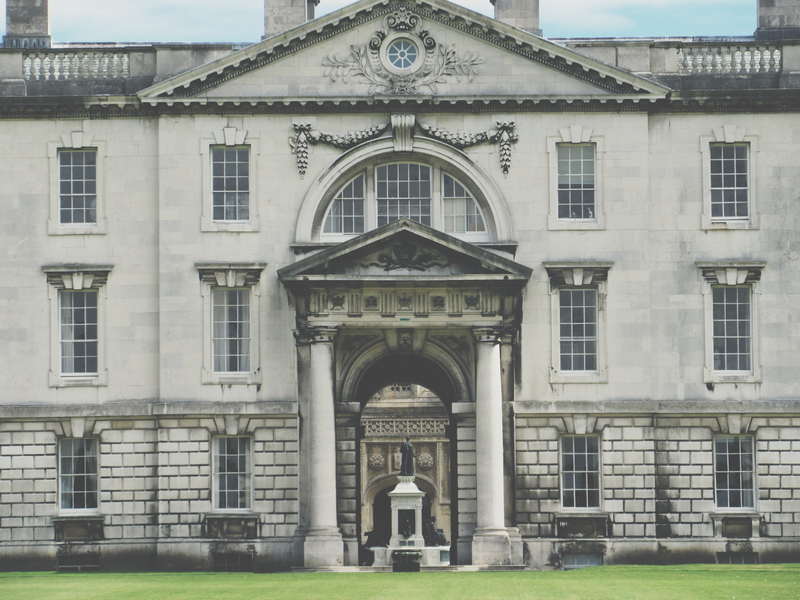 I decided rather than stay in Boston for the summer, why not take a look at some study abroad programs with interesting non-Finance classes? And so here I am! Studying three wicked cool subjects! And having the absolute time of my life! So check out what I learned about! I haven’t taken a real English class since high school and my brain was desperately in need of some literary critical thinking. This class was actually the deciding factor in my coming to Cambridge, if I’m being completely honest. Like most other people in the world, Jane Austen is my Held Most Ardently heroine. Her books were some of the earliest I remember reading and they’ve certainly played a huge part in sculpting my love for literature. I came into this class having read all the major novels but desperately in need of a forum to discuss them. Most of what I learned in this class had to do with the context of the time in which these beloved works were based and written. Austen grew up and started writing during a period of national turmoil and recovery, most of which stemmed from the French Revolution and the Napoleonic Wars and the OM² (“Original Mad Monarch” … any Targaryen fans in the house?) George III and that other guy George IV. A lot of her work was satirical and I never really understood the extent of that until I got to talk about it in depth here. I also wrote my final paper on the symbolism of mud, so I had a freaking GREAT time exercising my brain in this class. 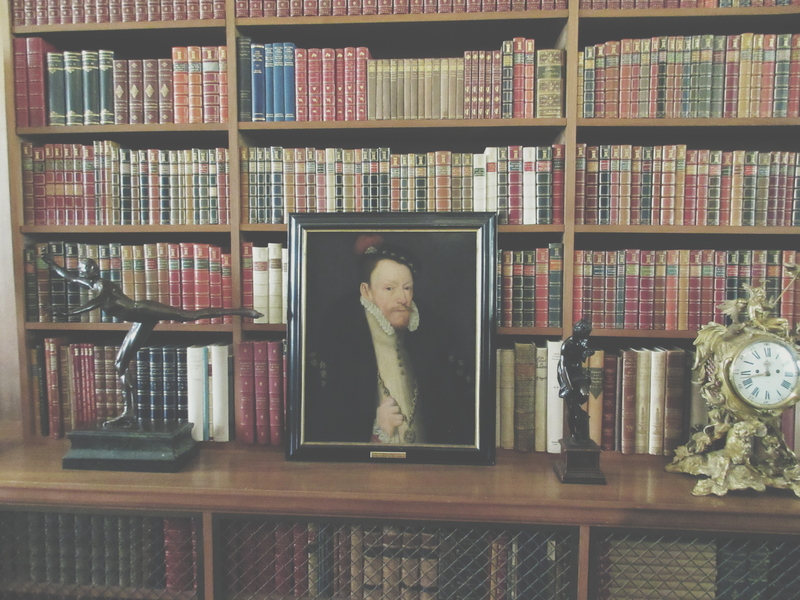 Oh, yeah – and there’s that time when my professor took us to the King’s Library where I got to exist as a person within INCHES of JANE AUSTEN’S LAST MANUSCRIPT. I SAW THE HANDWRITTEN UNFINISHED CHAPTERS OF Sanditon WITH MY OWN EYES! CAN YOU TELL I WAS SEVERELY AND PERMANENTLY AFFECTED BY THIS MOMENT? Also – I don’t care what anyone says, I will rep the Joe Wright Pride & Prejudice adaptation until the day that I die. Keira Knightley (200)5eva. Law has been a personal interest of mine since the good ol’ glory days of high school mock trial. American citizens don’t always realize just how differently the rest of the world treats a judicial system, so I thought it would be interesting to see what ours was derived from. My class even took a field-trip to the Crown Courts so I could see a trial in action and really get the feel of how it works over here. The English Common Law system is so fascinating because its basically been around in some kind of form since the 800s, which means that England has a hell ton of precedents. Fun fact: England does not have a stand-alone constitutional document outlining the rights of their people. Because they’re so old, they’ve got dozens (if not hundreds) of separate laws and documents and dusty tomes which together make up their fundamental Constitution. I’m sure there is a much more technical, jargon-laden way of saying that but all that I’m really trying to communicate here is: you crazy, England. If you really wanna sift through all that, I guess keep doing you. That’s exactly the type of thing that creates such an interpretive nature of practice in the English Common Law system, which in turn made for some equally stimulating and frustrating conversations in my seminar classes. Morality is a hard thing to use in defining rules sometimes. I wasn’t even supposed to be in this class! I had originally registered for a class on British Sports but unfortunately the professor teaching it fell ill and the class was cancelled before it began. I had to choose another to take its place but most other options were politically or scientifically oriented and I can’t think of anything in the world that would have made me more miserable. Thankfully, ‘Literary London’ was there to save the day. Not only has the professor for this class become my personal hero (he read Bleak House in a week), but thanks to him I’ve gotten exposure to centuries of inspired-by-London authors such as Ben Jonson, John Gay, Daniel Defoe, Charles Dickens, Sir Arthur Conan Doyle, Virginia Woolf, and Elizabeth Bowen. Early on in the course we took a field-trip to Smithfield and the Museum of London, where I took the cover picture for this post – I thought it was a nice little interdisciplinary artifact since “Dieu et Mon Droit” was also displayed in the court room I visited for Intro to English Common Law. Very proud of myself for retaining information and making that connection at the museum. I don’t think I can physically communicate to you how happy I am with my decision to come to Cambridge and give myself a break from the at-times-overly-mundane world of business administration. I spent my summer taking classes on subjects I have a genuine interest in and passion for, I met and had conversations with some of the brightest students from all over the world, and I got to see a f*cking Jane Austen manuscript (still tears, never gonna stop). Forever thankful for this experience. 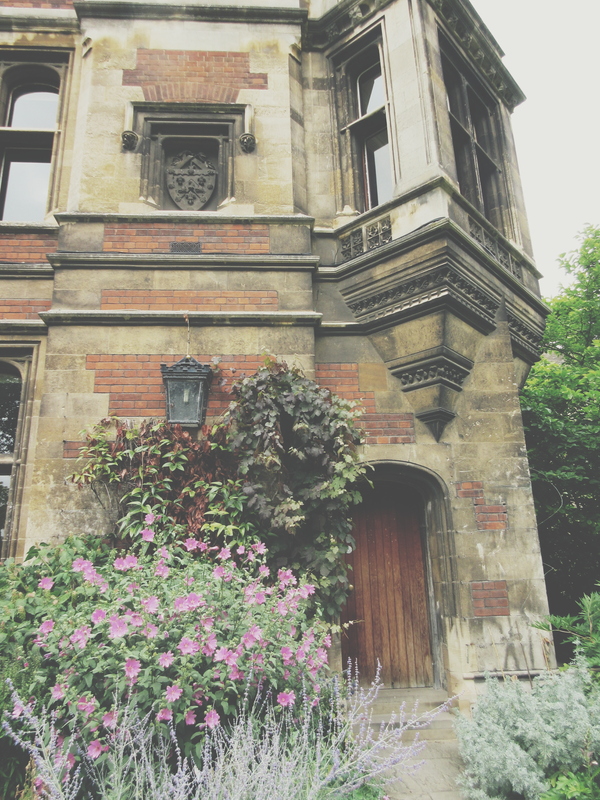 Can’t wait to come back to you with all my new friends and reminisce some day, Cambridge. I didn’t intend for this blog to be as photo-heavy as I feel like it’s becoming, but unfortunately I can’t think of anything else to share with you today! I’ve already missed the last two Sundays due to a stressful trip to Dublin and a recovery-from-said-trip weekend back in Cambridge. Speaking of Cambridge, you might be wondering “why is Cassie even there right now?” Great wonder! 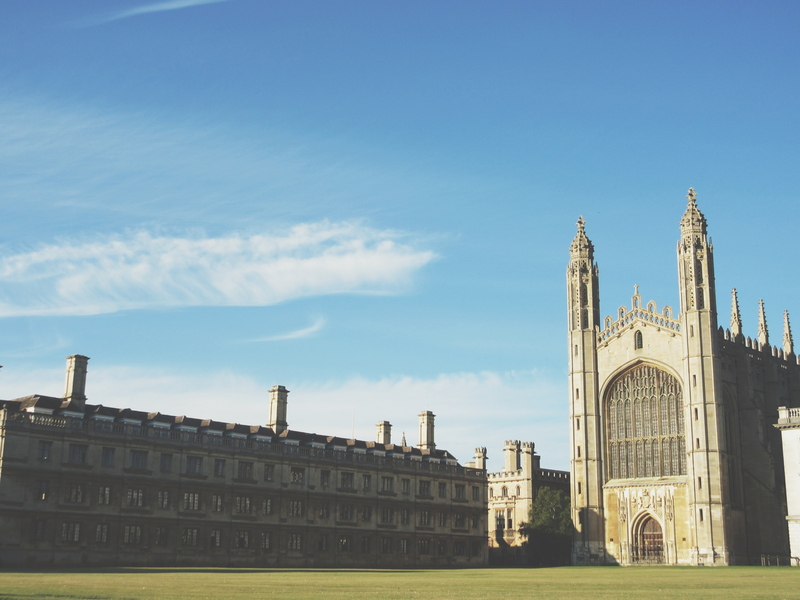 I’m here thanks to a little study-abroad adventure called the Pembroke-King’s Programme (PKP) at the University of Cambridge. I’ve been here since the end of June and figured now is the time to show you why my parents are going to have such a hard time getting me back to the States! 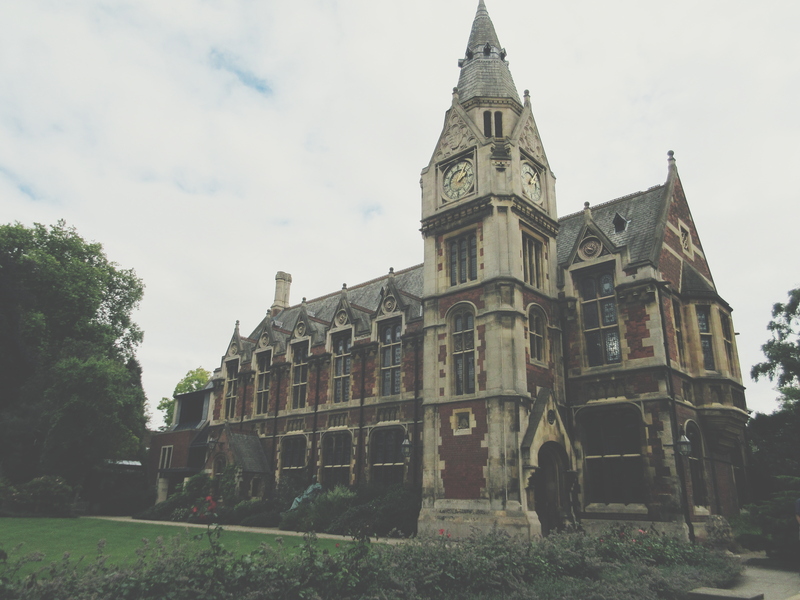 This week, I thought I’d spend my Sunday wandering around and taking pictures of my favorite spots in the two UniOfCam colleges I’ve been studying at. Enjoy! This is my resident college, the one I live and eat in (although technically I live outside of the college walls, around the corner). It was founded in 1347 and is by leaps and bounds my preferred college. It’s so cozy and comfortable and peaceful and overall it just has this feeling to it. I can’t really describe it, so take a look and see if you catch it too. 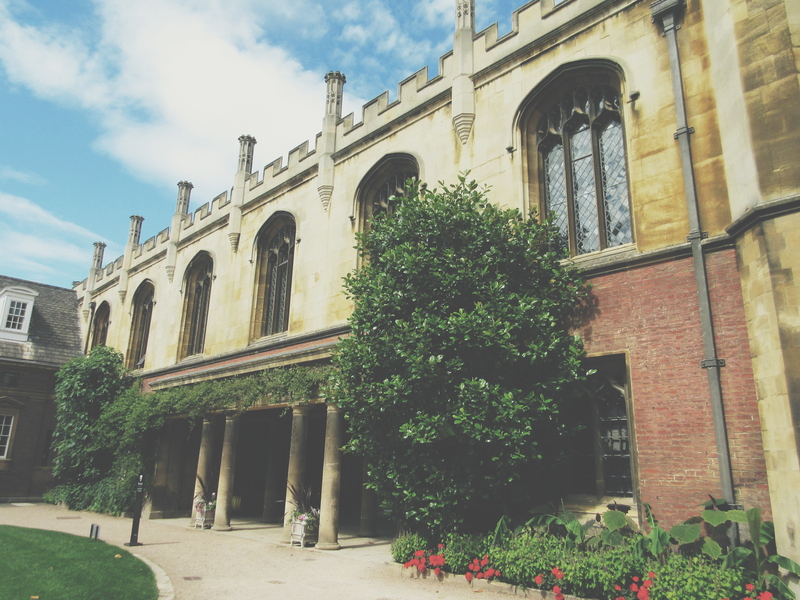 That tiny wooden door on the left leads in to the cafeteria, and the giant red brick building on the right is the Dining Hall where Pembroke College members eat. 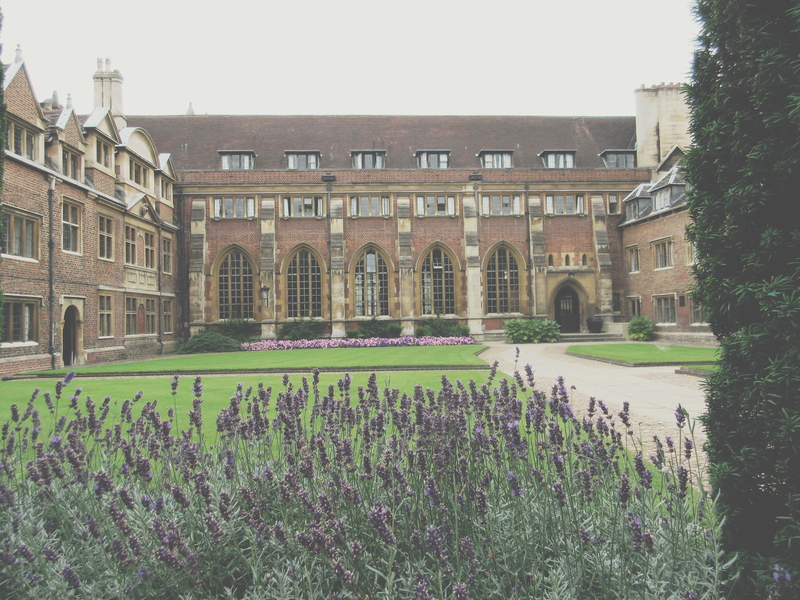 It’s also the building where the best Formal Halls in the entire University are held (might be a little biased… but I have a lot of fun at Pembroke Formals). PemBar, JP, the Cafe, whatever you want to call it – I’ve spent quite a few afternoons and evenings here. There are giant leather couches that will actually swallow you whole if you start dozing while working on homework. Or if you have one too many ciders at karaoke night. The New Library – my absolute favorite spot in the entire University. The building is beautiful inside and out. I usually tuck myself into the Classic Literature corner with all the Austens and Brontës because it can’t get more inspirational than that. If I ever become a novelist, I hope I get to come back and be it here. 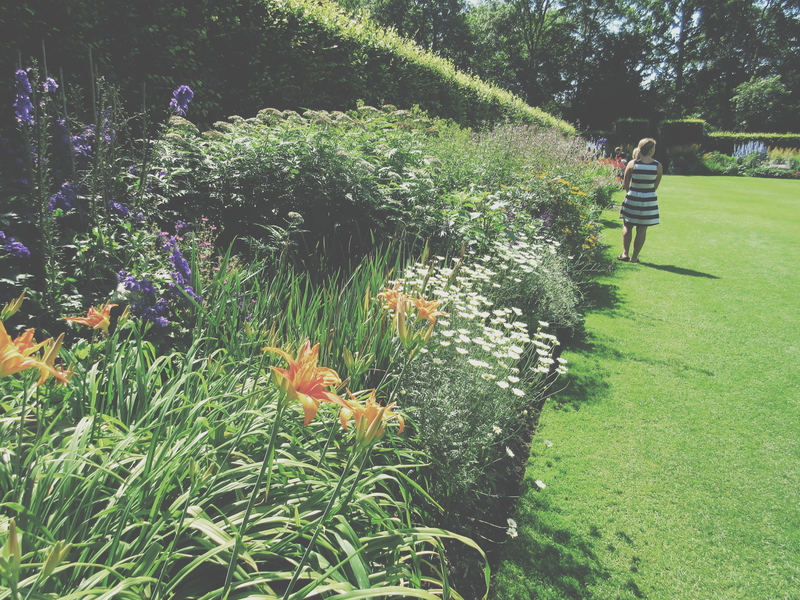 Pembroke’s campus is filled with quaint little flower-lined paths and crevices. 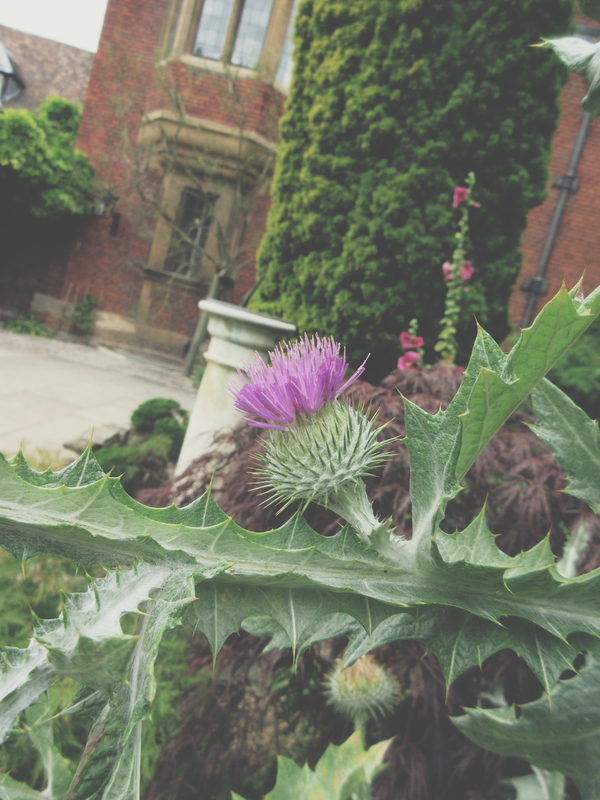 The Scotswoman in me totally lost it over this 6’+ tall thistle plant I stumbled across on my first day. Thankfully, a few purple-topped buds still remained for me to snap a picture of this morning. This is the opposite side of the Dining Hall. More flowers, more beauty, more immaculate grass you’re not allowed to touch. 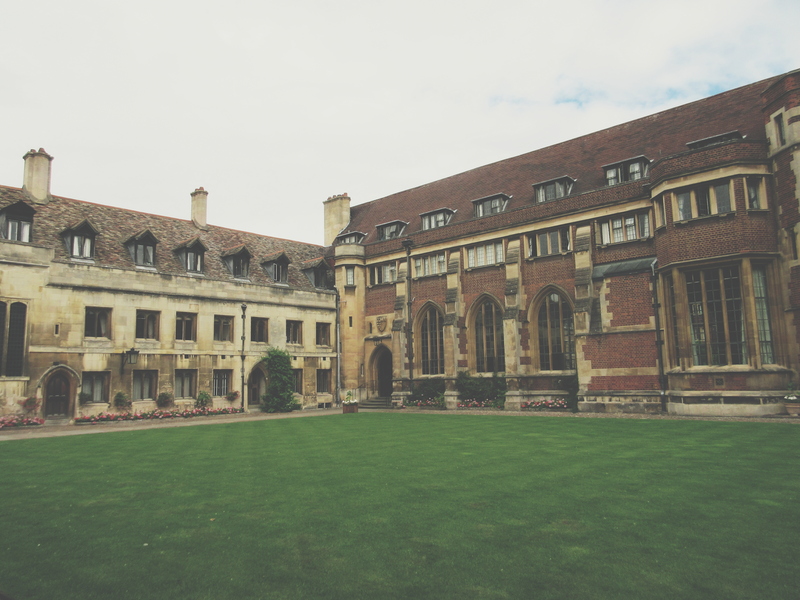 On one of my first nights here, I was curious about Pembroke alumni so I googled “famous people who went to Pembroke College.” Imagine my pleasant surprise when I discovered that Roger Williams, the founder of my beautiful hometown state of Rhode Island, attended Pembroke! I don’t want to call it fate, or destiny, or anything but I mean… that’s a sign. 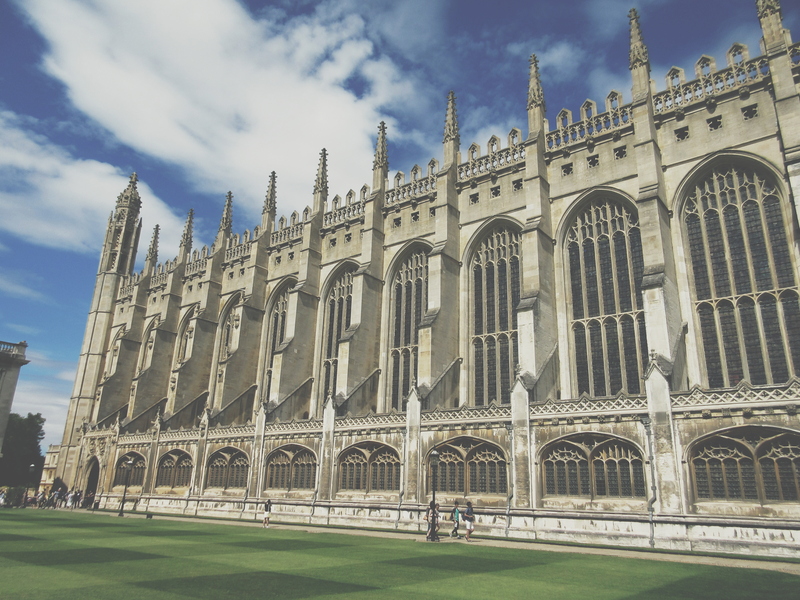 Founded in 1441 (yes, also before America was even DISCOVERED…), King’s is probably one of the most iconic Cambridge colleges. I can’t say I’ve spent a lot of time here, but I can say that my breathing still hitches every time I walk through the gate. The campus features colossally overwhelming architecture and wide, expansive lawns. 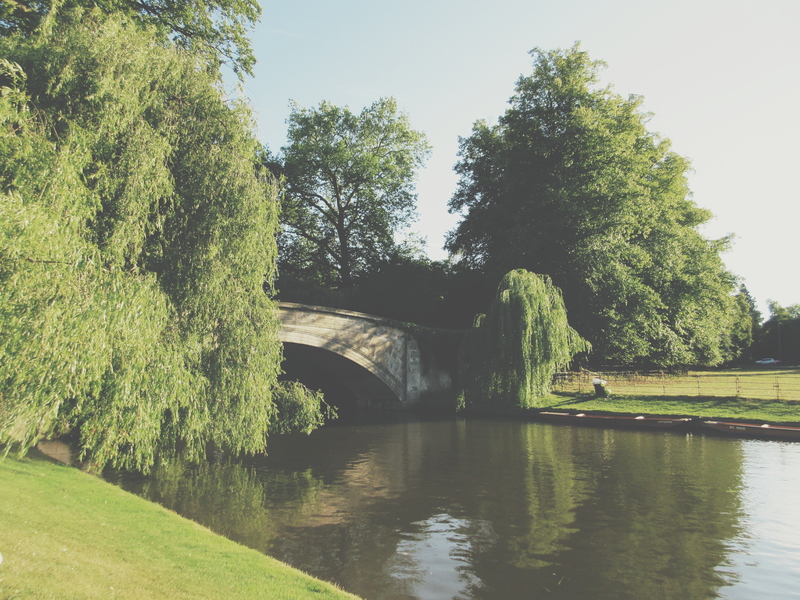 Not to mention it borders the River Cam, where you can sit on the banks gossiping with friends and laughing at tourists as they attempt to punt. This is the front gate that you have to approach in order to get in to the college. Usually it’s a battle through 15 different hoards of school groups and international tours, but the fight is well worth it once you see inside. 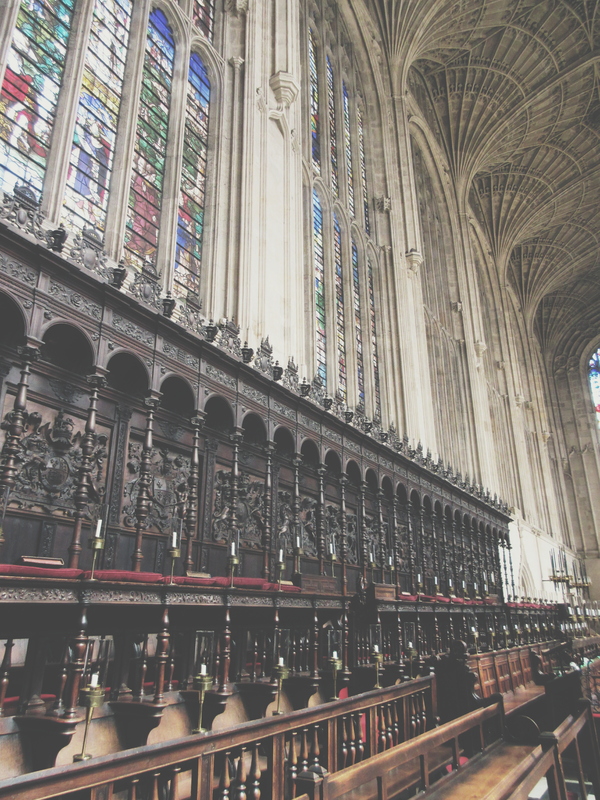 I’m willing to venture that King’s Chapel is way up there on the list of popular locations in Cambridge, if not #1. The building is ginormous and stretches half the length of the college. I had the privilege of seeing Evensong performed in the Chapel during my first week. 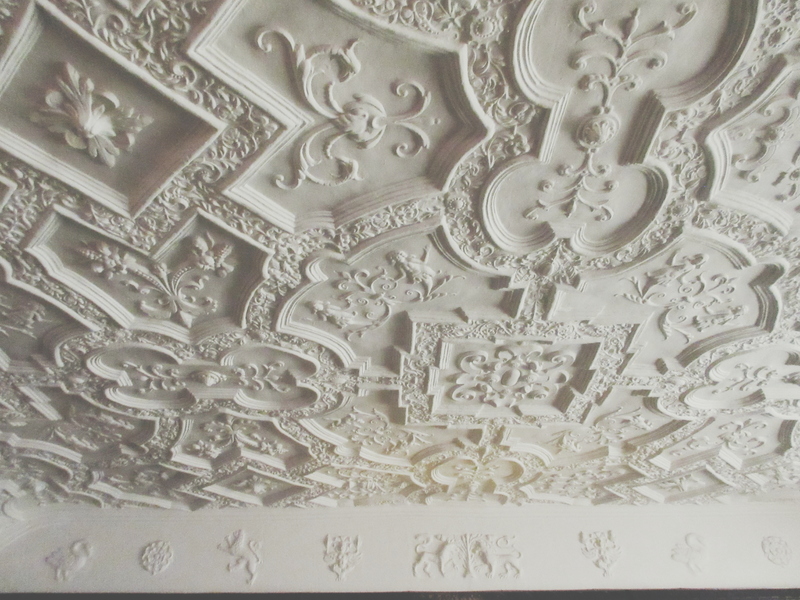 The ceiling of King’s Chapel makes you just want to splay out on the floor and get lost in admiring it for a few hours. Can’t tell you all the intricacies of the architectural style but can tell you that its totally rad in here. A completely mesmerizing place of worship. This is apparently Gibbs’ building but I’ve come to think of it as the scary place where all the Fellows hang out. This is the view you get when you’re standing on the bank of the river, looking through towards the Front Court. That statue in the doorway is actually a fountain on the Front Court, and the tiny dark doorway behind that is the front gate where you enter the college. My preferred spot to sit and people watch on the banks of the River Cam. Those are King’s College punts moored on the other side. Note: they’re a lot harder to maneuver than you might think. If I turn around in that exact spot next to the river, this is what waits behind me. That’s the iconic face of the Chapel on the right. I can’t say I’ve spent any time at all in the King’s library, aside from the welcome tour, but look how pretty it is! The library is elevated and runs along that top row of windows, which all face the quiet enclosed courtyard I was standing in to take this picture. 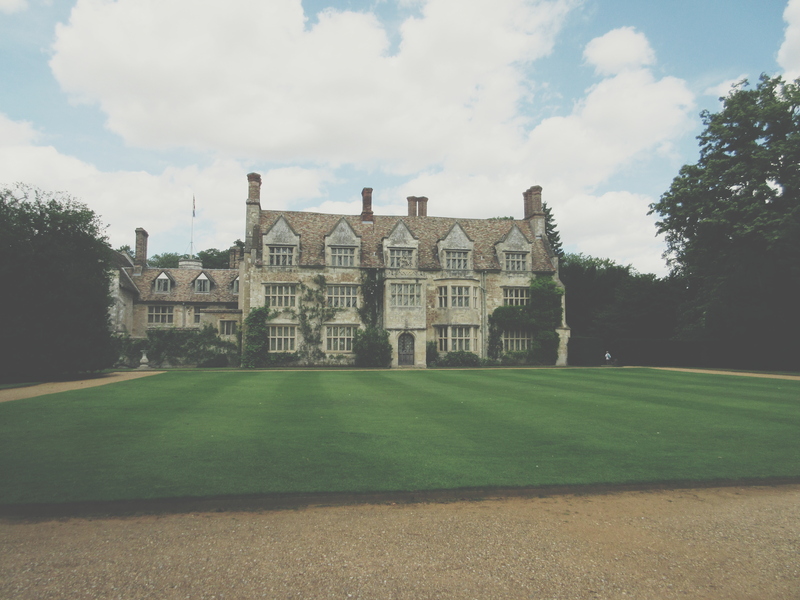 I formally declare myself lovingly obsessed with Anglesey Abbey. On Saturday I took a trip with a small group of darlings to this Jacobean-style country house in the nearby village of Lode. Rather than write you a play-by-play on all the things I saw, I figured I’d provide you with a few photos and comments on this fairytale of a place. We set off on a leisurely stroll down a series of paths just like this one to get to the actual Abbey. Yes, those are lily pads. And yes, they are stretching as far as your eye can see. One of our Program Advisors had been to the house before and served as an excellent guide through the overwhelmingly beautiful rooms. When I arrived in this particular one, I was so enraptured by the objects and artifacts around me that I completely missed the ceiling! Thankfully, she gave me a gentle reminder to “look up” and now I have this image in my life. Stunning paintings and portraits covered every inch of wall that wasn’t too busy being impressively ornate on its own. As I walked around, I noticed that my eyes were always drawn to the same dark, Gothic-style scenes. I discovered that they were all painted by the Pethers, two generations of incredible, moonlight loving artists. My camera could not have done the landscapes justice, so do yourself a favor and find the nearest original. Real tears of joy came to my eyes when I walked into the library. The original owners of the Abbey, the Fairhavens, were quite smitten with the Tudors so this room was home to several ORIGINAL(!) portraits of Queen Elizabeth I, King Henry VIII, and others. As the very same Program Advisor-turned-guide put it, I was in the same room as something that had ALSO been in a room with those figures at some point in history. WHAT? That means I can say I’ve basically met them, right? 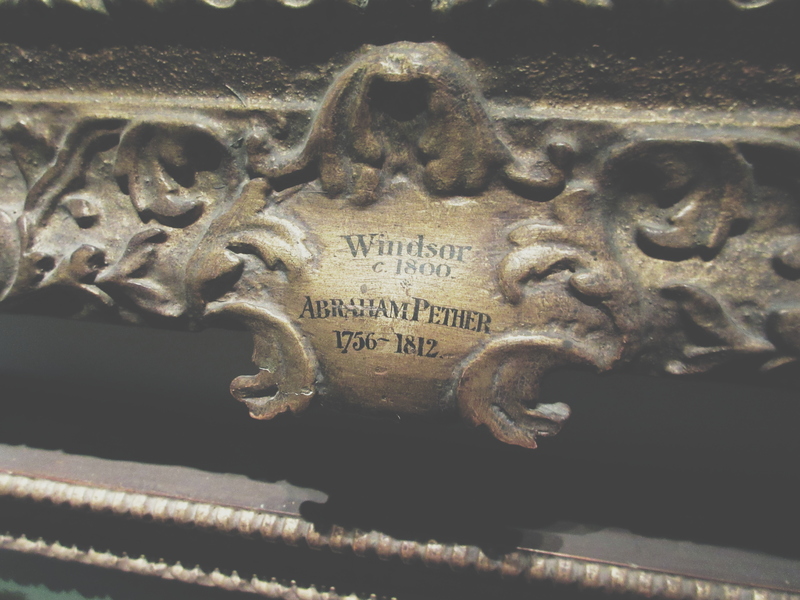 Oh, and Queen Elizabeth II also scratched her name into one of the library’s window panes while visiting… Casual. 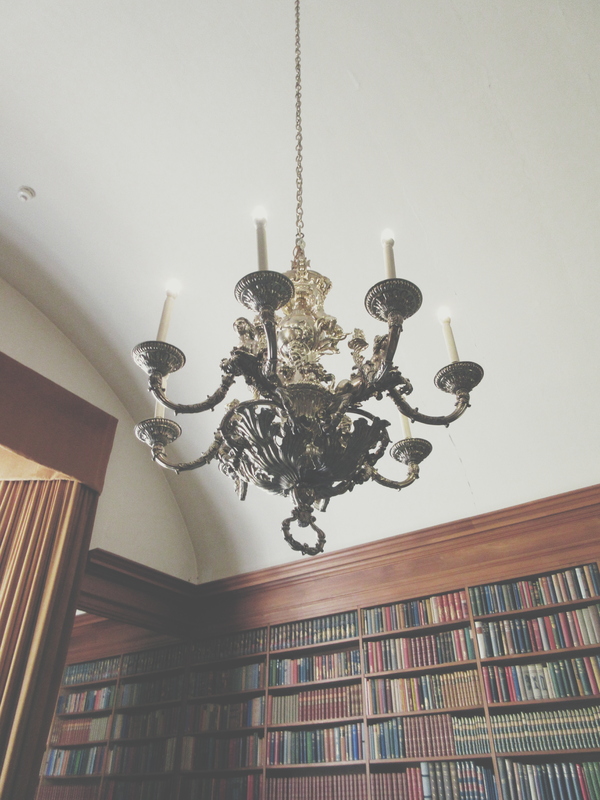 Another cool thing about this library was the two gorgeous chandeliers hanging from the ceiling. They are part of a set of five made by William Kent. The owner of the other three? Vladimir Putin. I believe they’re hanging in one of the Russian palaces. I could have honestly sat myself down and stared at this view all day long. 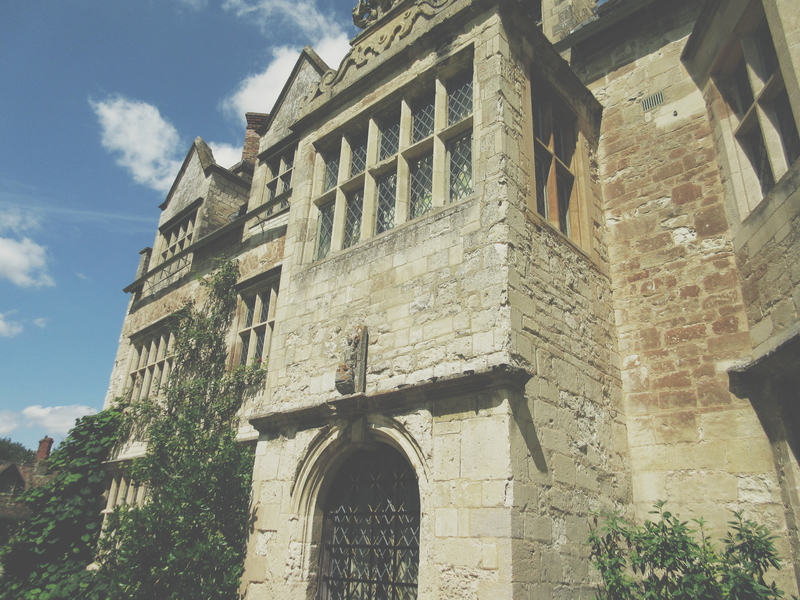 I’m in love with stone houses. There it is, I’ve said it. 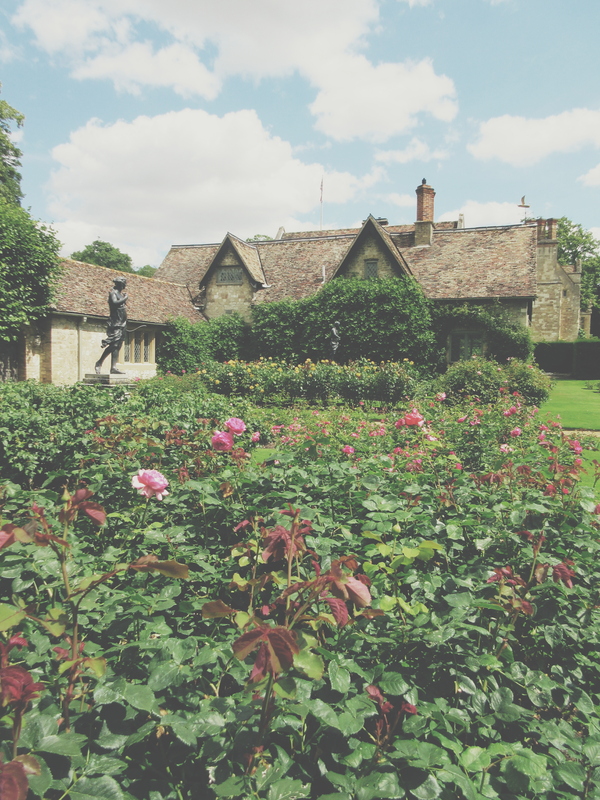 Lord Fairhaven installed a huge Rose Garden at the side of his house. He gets it. Unfortunately, I was too busy reverting back to the make-believe lands of my childhood to take many pictures of the grounds we walked around after visiting the house but let me tell you: this place is HUGE! 10-year-old me would have had the time of my life here. Plenty of gardens and woods and paths to run rampant through. Yes, I did pick up a stick and carry it around like a wand for a little while. 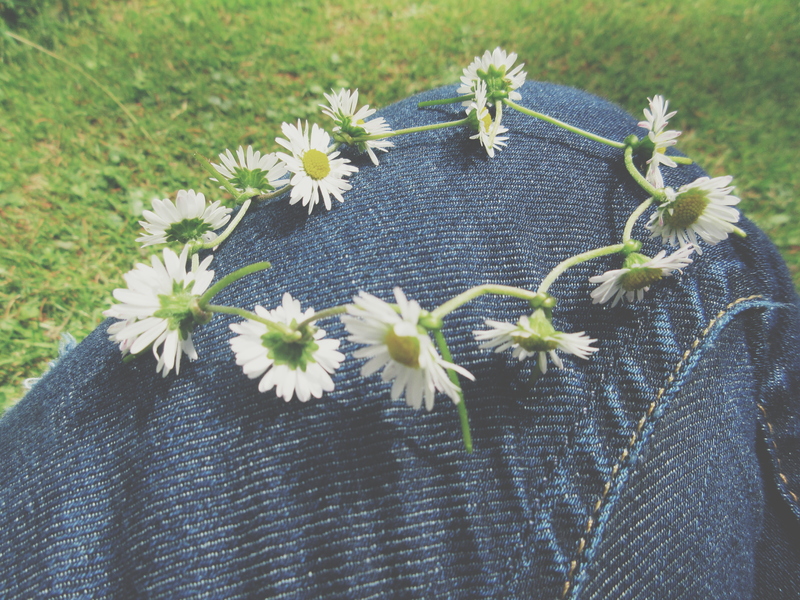 Before ending my day with some rose lemonade and a slice of Victoria Sponge, we sat ourselves down in a shady nook and I set to work learning how to make daisy chains. Apparently that is a skill acquired by many a British child in their primary school days, but I had never done it! We don’t really have wild daisies in Rhode Island. I will confess, I cheated a bit. You’re supposed to puncture a hole in the stem with your thumbnail and weave it that way, but I had to resort to making knots because my nails kept wrecking the stems. Quite a meditative experience, regardless. 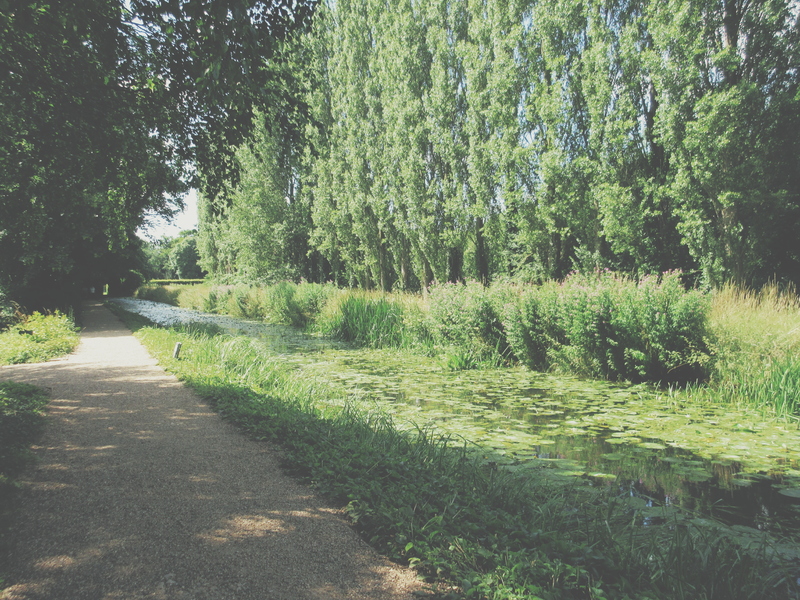 As was to be expected, my voyage to Anglesey Abbey left me in a state of hopeless daydreams. I hope these pictures can convey at least some of my love for this wonderful treasure. Last weekend I went to London and I paid £5 for a nothing-special beer, which hurt my heart. Granted, now I get to say that I’ve had a pint on Baker Street so I guess it was sort of worth it? Anyways, over the past two weeks I’ve discovered that Cambridge, UK has some very interesting drinking-related things going on and I want to share them with you! You don’t, you don’t, you do NOT drink alcohol at brunch here. In fact, you don’t drink alcohol before 12pm here. I guess I can see where they’re coming from, but Mimosas are so good! And Peach Bellinis! What is even the point of brunch without a pitcher of Peach Bellinis to gossip over? I guess food is more important to the Brits. Speaking of which, they serve onion rings at brunch here. I know. Ever heard of that thing called DNA? Well, it was discovered in 3D form here in Cambridge by Francis Crick and James Watson. 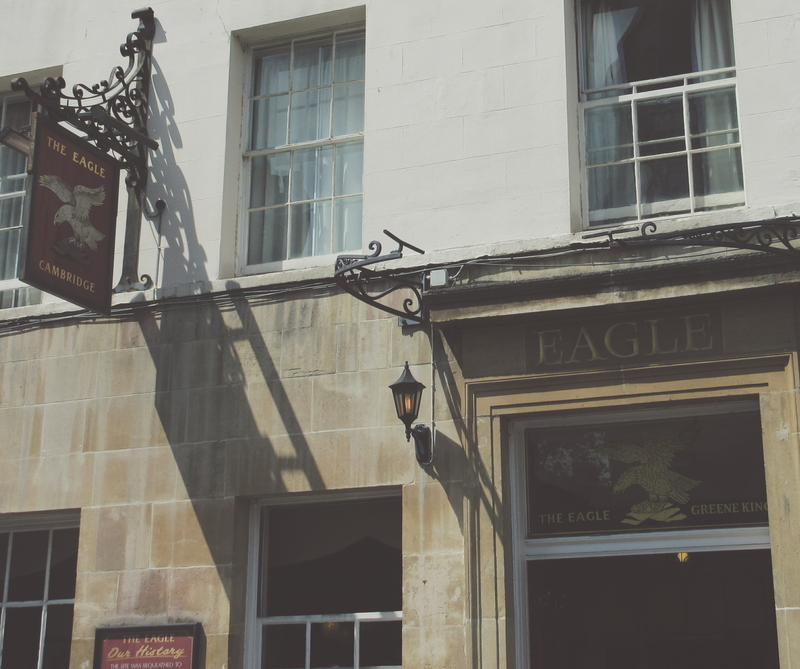 When they came up with their proposal for the double helix structure, they went to a spot nearby called The Eagle and made a huge announcement about it in front of the pub patrons! Naturally, I’ve resolved that I’m going to be making a lot more toasts to my accomplishments in pubs full of strangers because I think the world needs that. I’d pick the beer I had here over the one in London any day. £ 3. Keep off the grass! … Unless you’re in formal wear? 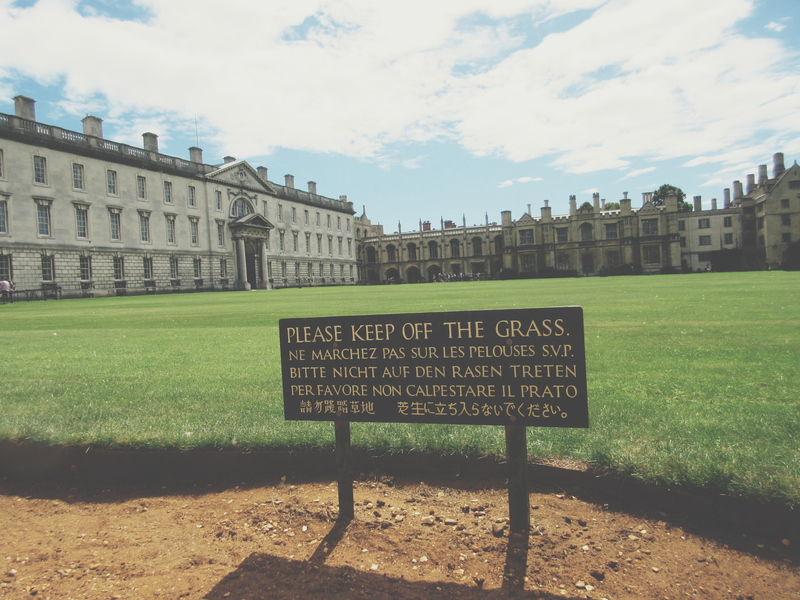 Yes, here at Pembroke College (where I’m studying) you are not allowed on the grass. There are two exceptions to this rule: 1) become a Fellow at the College (talk about motivation to get into academia!) or 2) dress in your best robes and gowns and attend a Formal Hall. At Formal Halls you get to have drinks on the lawn before dinner! I got to experience this last week and I was petrified the entire time that I would trip, take a huge chunk out of the grass, and as a result be sacrificed to the River Cam. £ 4. Penny for your drunk thoughts? Watch your drinks around here. At those same Formal Halls, it’s a popular game for Cambridge students to sneakily slip a penny coin into each others drinks. The premise is that the owner of the drink has to save the Queen from drowning and instantly down their glass of wine! I’ve since taken to carrying around a spare penny in my pocket at all times just to be on the safe side. Definitely from a retribution standpoint, guys. I’m definitely doing it out of defense. Definitely. One of my favorite spots in Cambridge, Hot Numbers, is a cafe by (every)day and a bar by (some) night(s). This is the case with quite a few little cafes around town and I am a HUGE fan. The Cambridge colleges have a similar type of deal where you can hang at the cafe areas and if you’re there long enough they’ll turn into a bar at some point! This makes sense to me! It’s just economical really. So, there you have it. I’ll be sure to keep you posted on other funny drinking habits I pick up on during my time studying abroad at the University of Cambridge. Now, who wants me to bring them back a British penny?